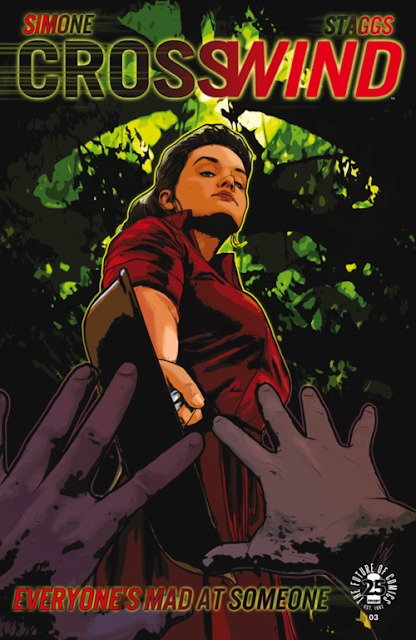 Few comics are as delectable as 'Crosswind' by Gail Simone and Cat Staggs. Freaky Friday and Goodfellas collide in a familiar but satisfying story of a timid housewife in the body of a gangster learning what it's like to be in control for once while the gangster in her body navigates the less dangerous life in suburbia. I don't care how predictable or how many miles away you can see the comeuppance of bullies and perverts coming, few things are as satisfying to watch. Movies during the 80's were built on underdogs overcoming obstacles to crane kick the villain in the face. Cason as Juniper had his hands full with a disrespectable stepson, a demeaning adulterous husband, a vulgar band of neighborhood bros, and the last minute dinner for her husband's boss. Turns out he's handy in the kitchen and even handier with a saucepan. Seeing him right the wrongs of Juniper's life is unabashedly indulgent and devilishly fulfilling. Juniper as Cason is where the real drama is. Juniper has so far been able to pretend to be the alpha male that Cason is but able to use her domestic goddess skills to clean up a bloody crime scene. Now faced with the crime boss's dufus of a son and a deadly associate who knows Cason has been sleeping with his girlfriend, the feds are on their doorstep so Juniper has to think fast. Juniper has to draw from her beloved crime novels that swept her away from her horrid underappreciated life. She's now in control, respected, and feared. She's never felt like this before and even though it's a deadly living, she's more empowered than ever. Simone is in her element establishing intense moments that are gleefully violent and shocking. Her command of the characters' inner monologue provides insightful and distinctive narration especially since they belong to the other person. She's in the zone as the build up to each confrontation is as visceral as Scorsese's crime films. Questions still remain though as the why and how this body swap happened but we're still half way through this limited run so answers should be right around the corner. The incomparable Cat Staggs delivers another photo-realistic gem full of modern day noir and expressive faces. The look on the characters' faces says so much that captions aren't necessary. The framing of the violence highlights the escalation until the sudden impact. It's morbidly enjoyable to see the bad guys get what's coming to them and Cat sure draws them with the same diabolical mirth. All in all, the art including the rich saturated colors makes 'Crosswind' a unique experience. Simone and Staggs are making one hell of an entertaining comic that preys on our most primal instincts. They challenge our moral makeup as to what constitutes justice and decorum if the shoe was on the other foot. 'Crosswind' meets our need within ourselves to fight back, beat the bully, face our fears, and become our true selves. It's freedom as subtext in one ballsy package. Pick up 'Crosswind' and feed your darker impulses.